As BBC buildings are working buildings, they can't guarantee who or what you will see on the day of your visit but you should get to see the newsroom and find out more about the BBC before having the opportunity to try reading the news or a weather report on an interactive news set. Hopefully you will also see the Radio Theatre and have a go at making a radio drama too. Tours last approximately 1.5 hours. 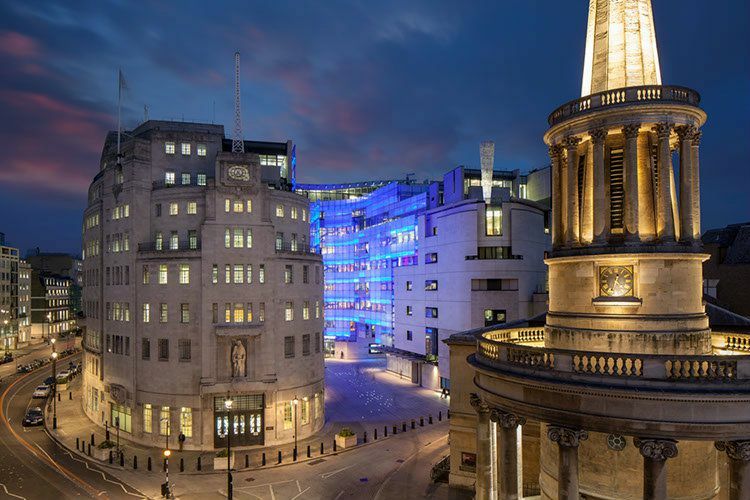 Due to copyright and security reasons, photography at BBC Broadcasting House does need to be restricted in some locations but there are many places throughout the tour where photography and having fun is encouraged. Do note, long-lens cameras are not allowed on the tour. You can book online or call 0370 901 1227 (from outside the UK +44 1732 427 770). All children under 16 must be accompanied by an adult. Children under 9 years old cannot take this tour. Tours start from the Media Cafe where you can get a drink and a snack, or visit the small BBC shop. When I visited there was a TARDIS and a Dalek for great Doctor Who photo opportunities too. Tours start promptly and there's an introductory talk in front of a big screen to show some of the studios in the building and to explain about the new and old Broadcasting House buildings and the ethos of the BBC. We then moved through for a better look over the newsroom and, just as the Guide was telling us that BBC newsreaders are actually trained journalists who write 85% of the news that they read, we spotted Sophie Raworth, one of the most well-known BBC newsreaders, who was at her desk preparing the lunchtime news report. From here it was our turn to try and read the news and we visited an interactive news set where some of the tour group got to try reading the news and presenting the weather. The newsreaders were given a script but the weatherman wasn't which is how the professionals work. As we had entered on the side of the building, the next part of the tour went outside so we could see the new Broadcasting House better. There's a lot of glass and it appears the architect chose that material to show the 'more open and honest' way the BBC wants to be seen. The dedicated entrance for Radio 1 was pointed out so we know where to stand if we hope to meet the A-list celebrities who visit regularly, such as One Direction, Justin Bieber and Miley Cyrus. The BBC had to offer some large-scale public artwork in return for planning permission for their new building. One is on the ground and one is on the roof. In the piazza in front of the new Broadcasting House you can see 'World' by Canadian artist Mark Pimlott. It's a series of longitude and latitude lines embedded into the paving along with many place names. If you look up you can see 'Breathing' rising up 10 meters on the roof of the East Wing. It is by Catalan artist Jaume Plensa and is a memorial to all news reporters and crew who have lost their lives in conflict zones. At 10pm every night, when BBC1 TV broadcasts the Ten O'Clock News, a beam of light is projected from the base of the sculpture to approximately 900 meters in the night sky. The tour continues inside the Old Broadcasting House with time some history and the opportunity to admire its fine Art Deco styling. The Tour Guides have an iPad to show more images too. We visited the Radio Theatre, described as one of "London's best kept secrets" where you can see new shows being recorded. (See Tickets for TV & Radio Shows in London.) Before ending our tour in a Radio Drama Studio where we got to read from scripts and create fun sound effects. The writer was provided with a complimentary tour for the purpose of reviewing those services. While it has not influenced this review, About.com believes in full disclosure of all potential conflicts of interest. For more information, see our Ethics Policy.